A job search requires perseverance and exposure to companies of interest. You can pick up the phone, call companies, cross your fingers and hope for the best OR you could do some research, get the right people on the phone and dazzle them with your experience. How do you research companies? Am I interested in a specific industry? What size company do I want to work for? Am I willing to relocate or do I want to remain local? How far am I willing to drive? Diversity sites that award companies for certain cultural activities such as the Best Places for Working Mothers or Best Places for Hispanic workers etc…. These sites will help you understand the values and culture of the companies of interest. Internal Resources: If you know anyone who works at the company, call them. Ask as many questions as you can. Feedback from internal employees can be very valuable. I ALWAYS recommend checking at least one financial resource on a company. A few years ago, my friend, George, was called by a search firm about a job. The search firm provided my friend with a packet of information on the company. He read all of the information provided, but did not do any additional research. He called me VERY excited because he was offered the job. I congratulated him but the company name sounded familiar for some reason. My intuition told me something was wrong so I decided to quickly do some financial research. I was right. The company was in serious trouble with the SEC. Ultimately, George did NOT accept the offer and the company closed within 5 months. Research saved the day!!! “Who is in charge of (Fill in the Blank with your Department of Interest such as Finance, Accounting, Logistics, IT, Manufacturing etc…)? As you make these calls, create a spreadsheet containing company name, contact name, email and phone number and a few basic facts on each company. Before hanging up, graciously request that they send you any additional company information that cannot be easily found on their website such as a company newsletter, a hard copy of the latest annual report or any other interesting facts. (Every time, I would receive a packet in the email that was 3 inches thick — full of VALUABLE information. Yes, this takes some work but it is WORTH it!!!). This may seem unnecessary but a quick review of the information can lead to you finding a fact that you can use to your advantage. Additionally, working in HR, over the last 20 years, if I had a dollar for every time that a hiring manager said, “It was pretty clear that they did not do any real research on the company. A simple Internet search or reading our website does not cut it.” Consistently, none of the candidates who did limited research were hired. 100% of the time, the candidates who went the extra mile in their research got HIRED. 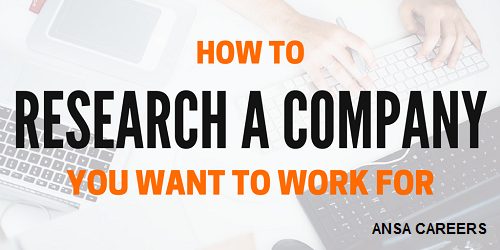 Again, it is some work but it will work FOR YOU in your job search. Please note: these are the top companies that you are targeting in your job search. This does not mean that you are limited to ONLY these companies. Feel free to continue to use major job search sites to find job listings and to apply to those listings. Once you have your list of companies with relevant contact information, start calling the contacts!!! You are on your way to finding your dream job! Have something to say about this article? share it with us in the comment and not forget to share this post with your friends on social medias. ← Do You Really Need A Degree When Looking For A Great Job?